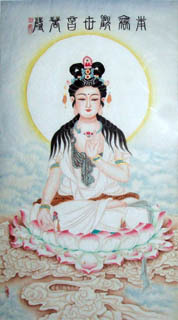 Avalokiteshvara (Sanskrit) embodies boundless compassion and loving-kindness. 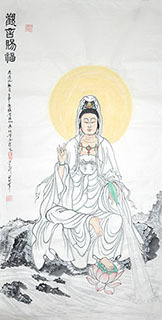 He might be the most famed and venerable Bodhisattvas in Mahayana. 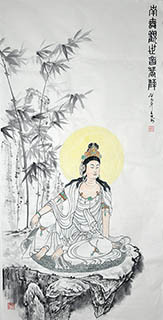 In China, Avalokiteshvara takes a female form and is called Guānshìyīn Púsà (觀世音菩薩)(also be referred to simply as Guanyin, Kwan Yin, Kuanyin in certain contexts ), which is a translation of the name "Avalokitasvara Bodhisattva." 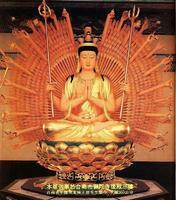 According to legend, Avalokiteshvara is the chief Bodhisattva. He has measureless wisdom and supernatural power. And he vowed that he would help all sentient beings be free of all the realms of suffering. 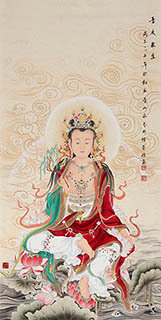 Normally, in Buddhist art, he may hold a lotus, mala beads, or a vase of nectar with willow, sitting on a lotus platform or standing, in meditation. 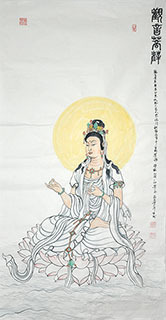 It can tell from his face and silent gaze the compassionate spirit, mild nature and motherly temper in them. 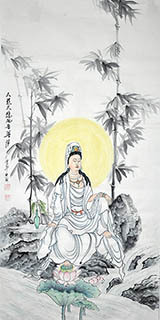 For the practical application of Feng Shui, the painting of Guanyin is suit to place in the position of honour—the first place everyone could see when they open the door. 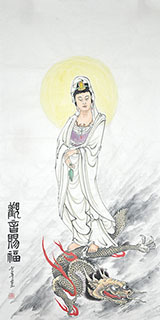 It is wrong to put the Guanyin painting in bedroom. 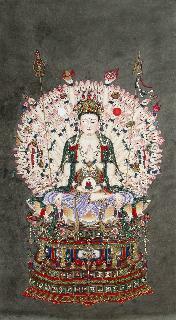 People created more than 30 different images of Avalokiteshvara. 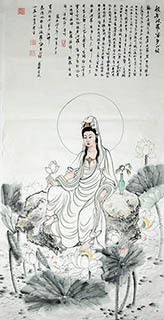 Below are two most typical images in China. 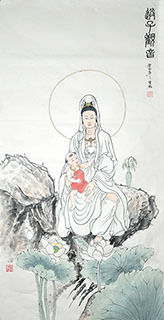 Avalokiteshvara with a child in arms(song zi Guanyin 送子观音) Painting. She seems tender and dignified with smile. 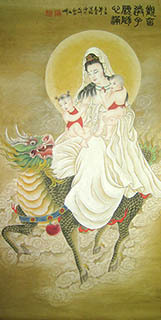 People who pray for child will worship the Avalokiteshvara at a temple, or hanging one painting in house. 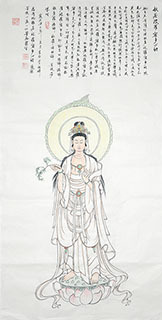 Thousand-Armed Avalokiteshvara(qian shou Guanyi 千手观音) Painting. 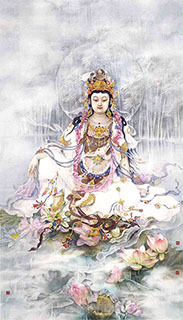 Avalokiteshvara is sometimes represented with 1,000 arms and an eye in each palm to help all and illuminate all with the light of wisdom. 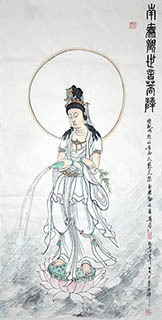 People always think that who enshrine and worship the Thousand-Armed Avalokiteshvara will get the assistance in times of difficulty, and have things as they wish.